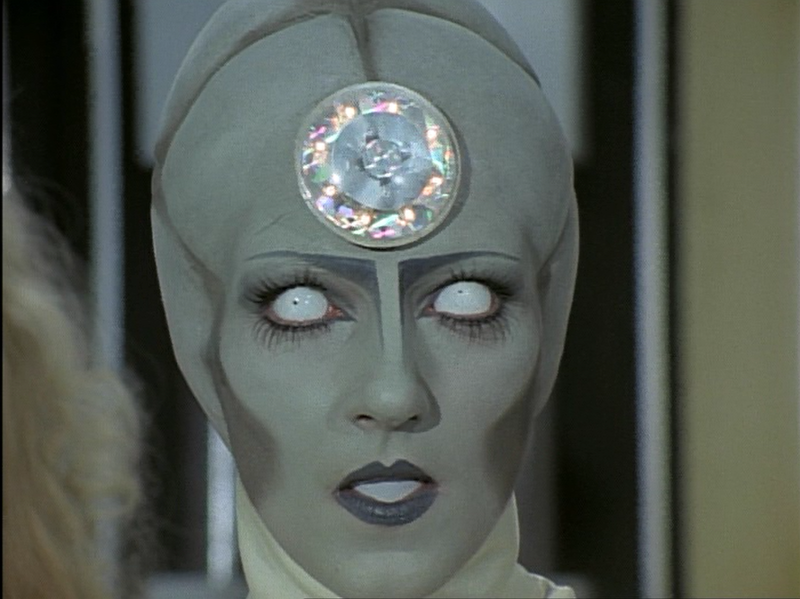 Cult-TV Blogging: Star Maidens (1976): "Nightmare Cannon"
Star Maidens' tongue-in-cheek story-telling style continues with episode three, “Nightmare Cannon,” written by Eric Paice and directed by Wolfgang Storch. "Nightmare Cannon" commences as Medusan refugees Shem (Gareth Thomas) and Adam (Pierre Brice) -- free in England -- commandeer medieval Wessex Castle and hide there (after freezing a kindly security guard they mistake for a Baron. 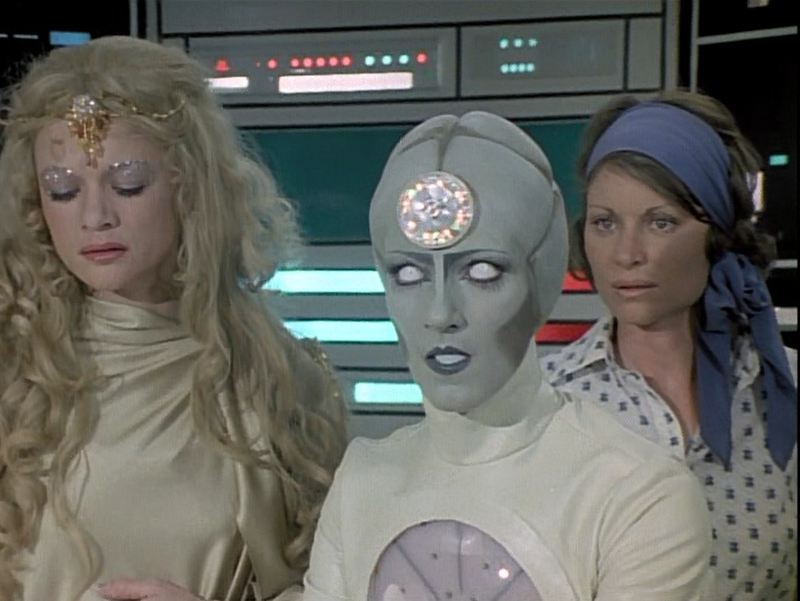 They still hope to escape the clutches of their would-be captors and female overlords from Medusa, Fulvia (Judy Geeson) and Octavia (Christiane Kruger). Meanwhile, Earth scientist Liz Becker (Liza Harrow) and her German (and highly-excitable) assistant Rudi (Christian Quadflieg) take advantage of the fact that the Medusan women left the door to their advanced spaceship, Nemesis, wide-open. The Earthers sneak aboard, and Rudi is promptly blinded by a high-tech control panel while snapping photos of the advanced technology. His impaired physical condition requires the aid of an absolutely terrifying robot physician. This female doctor boasts long wiry needles on the end of her fingers, has dead white eyes, wears horrific blue lipstick and speaks with a metallic inhuman voice. 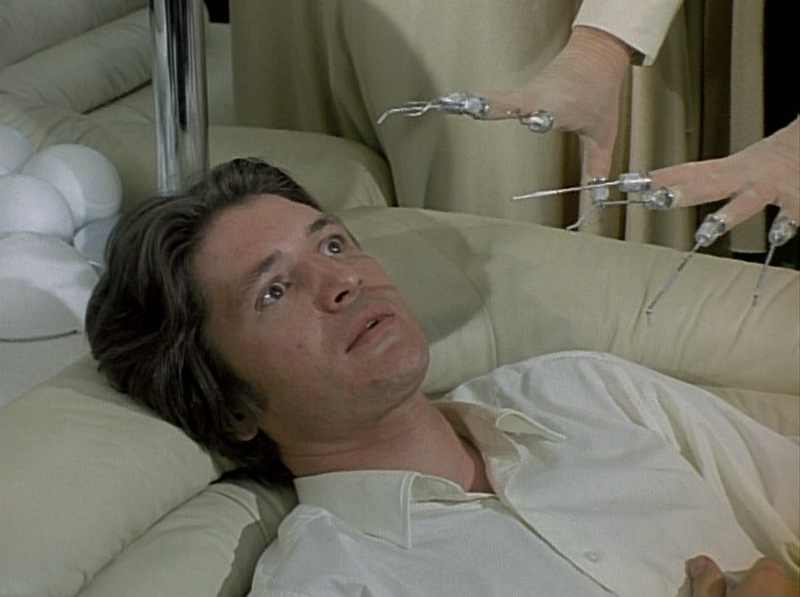 Apparently, the people of Medusa have never heard of a good bedside manner. It is explained that this device "projects" a series of sonic sounds at the target to "disturb the hypothalamus" and cause visual hallucinations and nightmares. 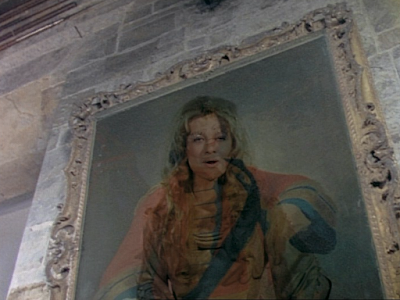 In the castle, Shem and Adam rapidly experience hallucinations, seeing weird phantasms of Octavia and Fulvia. This sequence includes the worst special effects yet seen on the series, as the faces of the Medusan ladies are superimposed awkwardly over live footage in the castle (and at one point, even inside the clanking armor of medieval knights). While all this is going on, the English government finally sends a representative to the scene (the Minister for Interior Security). About time. One might think that advanced aliens armed with immobilizing stun guns, nightmare-cannons, Nemesis spaceships, and "man finders" might be a matter of interest and some import to the national government. So far, no high official on Earth, from any nation, seems interested in opening diplomatic relations with Medusa. Finally, the episode ends with the Nemesis taking to space, with Liz and Rudy aboard, which, we shall see next week, culminates with a welcome visit to Medusa.
.*According to Octavia, the English language can be learned by an "educated" Medusan in five minutes. This explains why universal translators are apparently not necessary, and there is no language barrier between Terrans and Medusans. *Medusan proverb/quote: The male's fear of the female on Medusa is "the key to good government." This makes perfect sense in a repressive, tyrannical society. Those in power don’t want respect or input, they desire the fear of their citizenry, so that they may remain in power. Overall, I have to note that, at this point, Star Maidens is not nearly as intriguing as my memories from childhood suggest. 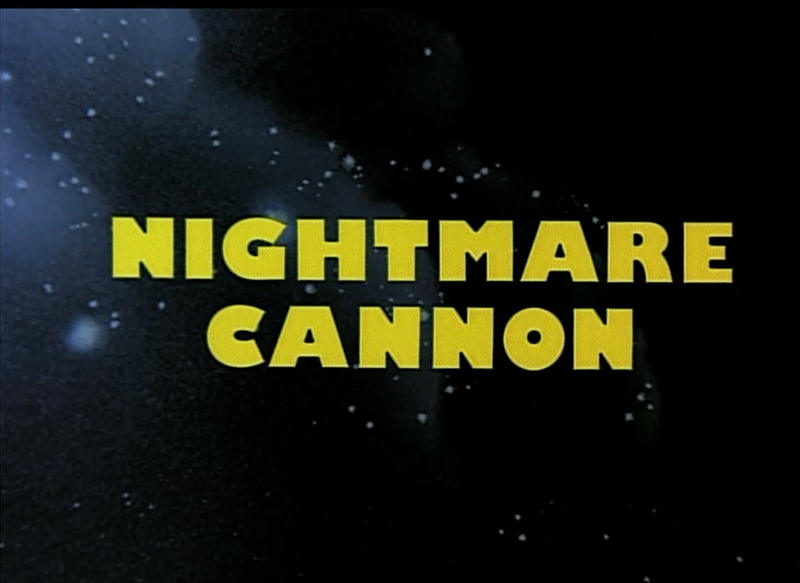 “Nemesis” and “Nightmare Cannon” are largely earthbound, with very little in terms of Keith Wilson’s production design to recommend it. Also, there is very little here in terms of miniature/live-action special effects of quality. The alien robot, however, did appear in many periodicals and stills of the mid-1970’s, and is appropriately terrifying.